Boston, it&apos;s been some kind of February. We&apos;ve seen the alps of MIT, the snowbound sidewalks of Huntington Avenue, and more. But March has arrived and fortunately, Dine Out Boston beckons with offers at Thai restaurants in the South End, the bistros of Cambridge, and much more. Dine out Boston runs from March 1-6 and March 8-13 and you can learn more about each restaurant here. What&apos;s most remarkable is the range and breadth of the restaurants that are participating this year. You can partake of lunch ($15-$25) or dinner ($28-$38), which is a terrific way to have a fine outing around the Hub and beyond. How will you experience such a culinary adventure? You might plan an outing with friends visiting from out of town, a working and pleasurable lunch with colleagues, or a celebration of an anniversary, birthday or early St. Patrick&apos;s Day fete. And oh yes, there&apos;s another carrot to get you the social (media) swing of things. 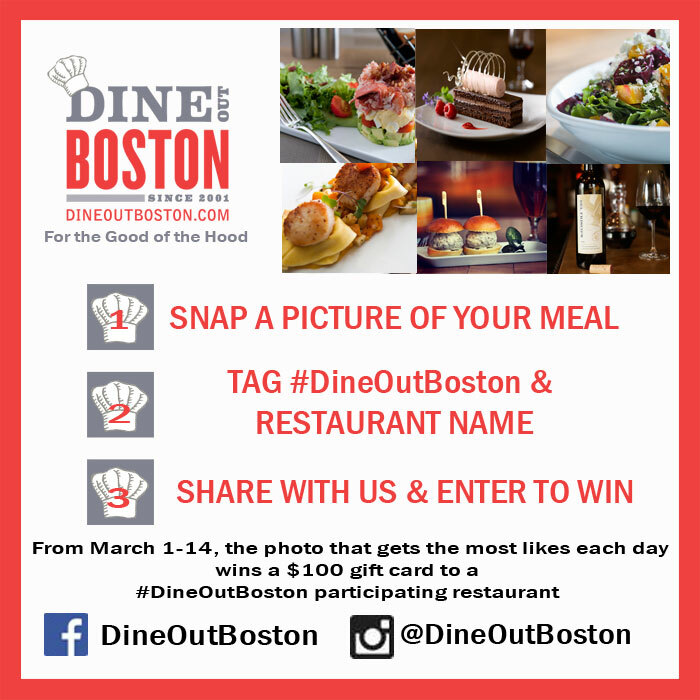 For each day of Dine Out Boston, restaurant aficionados can snap a photo of their meal, add the tag #DineOutBoston along with the name of the restaurant and post it on Facebook or Instagram. The photo with the most likes will be awarded a $100 gift card from a Dine Out Boston participating restaurant. For additional details, you can check out this page. As far as your photo, you definitely want to capture your entree, but why not do something different to distinguish your photo? Try to get a shot that captures the unique qualities of the restaurant such as the decor, a creative place setting, or another notable detail. Make things pop, try a different angle, and you&apos;ll have a leg up on the competition. So start planning, get a group together and go out to celebrate the great restaurants we have here in Boston. Along the way, you&apos;ll be supporting those folks who make the city a world-class destination for diners from Melrose to Mumbai. Don&apos;t be shy about asking questions about the restaurant when you&apos;re out, participate in the social media contest, and enjoy!